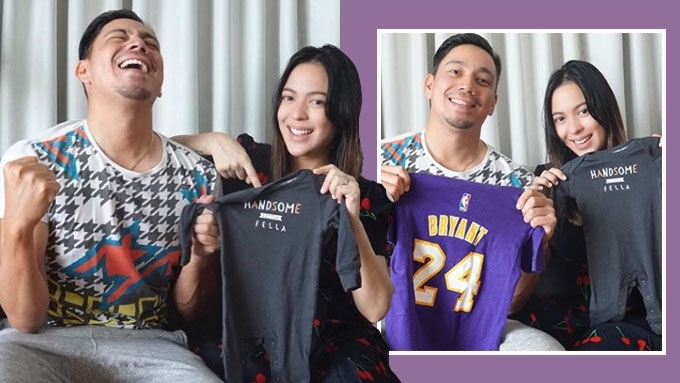 Karel Marquez and husband Sean Fariñas ecstatic over answered prayer: A baby boy! It is a boy for Karel Marquez and Sean Fariñas! The excited parents-to-be revealed the happy news on their Instagram accounts. "It's a healthy, '100% BABY BOY!!!' as stated sa results yesterday!" Karel announced after her ultrasound the day before, February 19. Karel continued in her Instagram post, "All along kala ko baby GIRL, but no no no! "It's my husband’s answered prayers, and mine too because this baby boy is growing well inside mama's womb! "Sabi sa ultrasound, nose ko at long legs naman ni daddy! Wow ha talaga lang ha. We can't wait to meet you!!!" In her next Instagram post, Karel revealed that she and Sean already have a name for their son. The L.A. Lakers basketball jersey that Sean was holding up in the picture already provided a clue to the name. "See you soon, KOBE FEDERICO Santos Fariñas! "Ok. My husband and I had a deal. Wala ako magagawa, idol n'ya si Kobe Bryant kahit ako hindi, but since all my kids ay may 'K' name forever, pumayag na ako. Para happy kaming dalawa. "Federico, our son's 2nd name, is my husband's late father's name. Fair enough. GREAT deal. Both parents, happy! "And if we have a baby girl next, my husband agreed na ako naman ang pipili ng name, 'K' pa rin, shempre. "Fair! Anyway! Still on a high! We're sooo excited to see you Kobe beef, este, handsome Kobe boy! (shout out to @inmywomb for being my go-to ultrasound place since 2009!)" Baby Kobe Federico is Karel and Sean's rainbow baby. Back in 2017, Karel was pregnant with her first child, but sadly, she suffered "an early miscarriage at five to six weeks." More than a year later, Karel was happy to reveal that she and Sean were given another chance at parenthood. She announced her pregnancy on November 17, 2018. Karel has two kids, Keiley and Kyler, by her former partner, Arman de Guzman.